Posted in Road Trip	by Rach L.
This a continuation from my honeymoon trip, picking up right after we left a couple amazing days in Austin, TX. The next couple days were our heavy driving days, so pretty uneventful food-wise. That being said, it was pretty cool seeing the full countryside of America and we got to take a break from the go-go-go of the previous days. We also drove part of the historic Route 66, which we thought was pretty cool. The day we left Austin was a long day of driving to get to Turquoise Trail RV Park in Albuquerque, NM, but we also experience one of the highlights of the trip. Throughout the trip, we’d posted a decent amount of photos to Facebook, to share with our parents and to show off for our friends. This became an inadvertent blessing, because a friend of mine from high school wrote on Akil’s wall that she now lived in Texas, and would we be passing her along the way? We figured that getting to her would only be about an hour out of our way, and an hour outside of hers. Our moms still talked, so I knew a bit about her life, but it was so meaningful to be able to see each other after all these years. 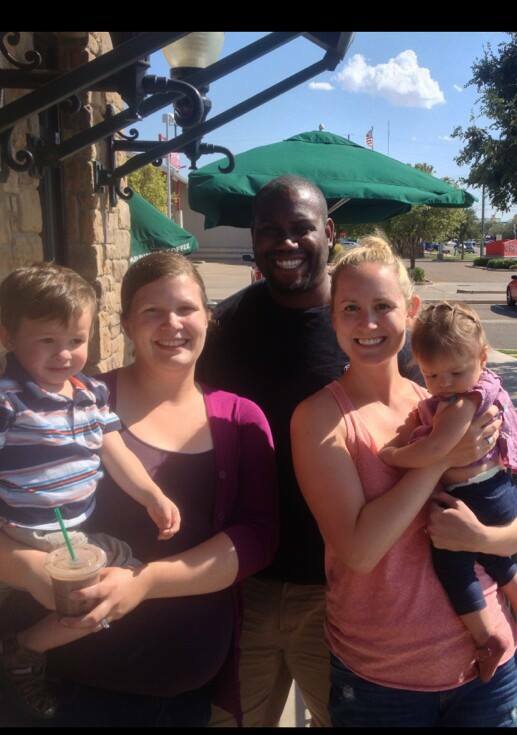 We parked ourselves in a Starbucks and reminisced about old times and got to meet each others’ husbands, and I got to meet her two beautiful children. It is certainly a moment I will treasure from the trip! The second night in Austin we each slept about an hour. The heat was so oppressive, and there was nothing we could do. Unfortunately the sun setting didn’t help to cool the RV, so it was a sleepless night. We bought a fan the next day hoping it would help (it didn’t.) Even without sleep, we woke up excited for our next adventure. Other than the music, we knew we needed to see the food trucks when we went to Austin, so we signed up for an Austin Eats food truck tour. This may have been the best decision of our roadtrip and will be something we sign up for again on our next visit! Sorry for yet another long delay in posting, but I did a big overhaul of organizing photos recently and also haven’t been in town over a weekend in almost a month. It’s good to be back, though, and I’m hoping I can get some time to cook again soon. In the meantime, I’m going to keep going with some honeymoon posts. Next up, Austin! I’m really excited about this post since Akil and I just booked tickets to go back to Austin for another visit. We really fell in love with this city when we visited. It has a really relaxed vibe, an unbeatable music scene, a healthy and energized population, and some pretty amazing restaurants. Let’s go see some ‘gators! For our second day in New Orleans we ate some breakfast in the RV and headed about twenty minutes out of NoLa towards Airboat Adventures. We did the group airboat gator tour, where we saw about 10 gators and even got to hold a baby one! It was surprisingly soft, although we don’t recommend trying it out as a pet. After the afternoon tour, we drove back to the RV park. We didn’t head straight there, though. First we had to make a stop at one quintessential New Orleans place: the drive-through daquiri. 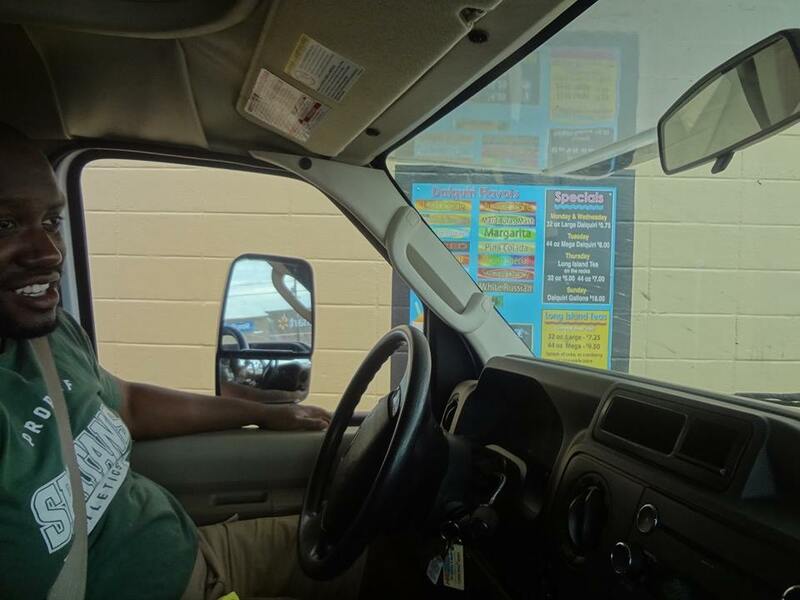 I couldn’t stop laughing at the sight of our giant RV going through the drive-through, although the server seemed less than amused. We asked her to describe one of the flavors and she said she didn’t know how to describe it, so we stuck with orange. Later that evening we headed back downtown. We took the local trolley and local bus towards Magazine street and stopped at a happy hour at Bouligny Tavern. This was a hipsters paradise, complete with a dark bar, chic cocktails, and a music played with actual old school records. We didn’t want to spoil our appetite for dinner, but we did get the gougeres, which were out of the world amazing. Whenever we go back to New Orleans we are stopping here for a full meal! Our next big drive was from New Orleans to Pecan Grove RV Park in Austin, TX. We had a few stops I knew we had to make on the way, so we got going pretty early. Luckily we were still full from those po’ boys, so no need to stop for breakfast. The first stop was the San Jacinto Monument in Houston, which is even taller than the Washington Monument, so it was a bit of a novelty for us. The area also boasts one of the largest shipping areas in the US, so there were a lot of interesting things to see and learn about. 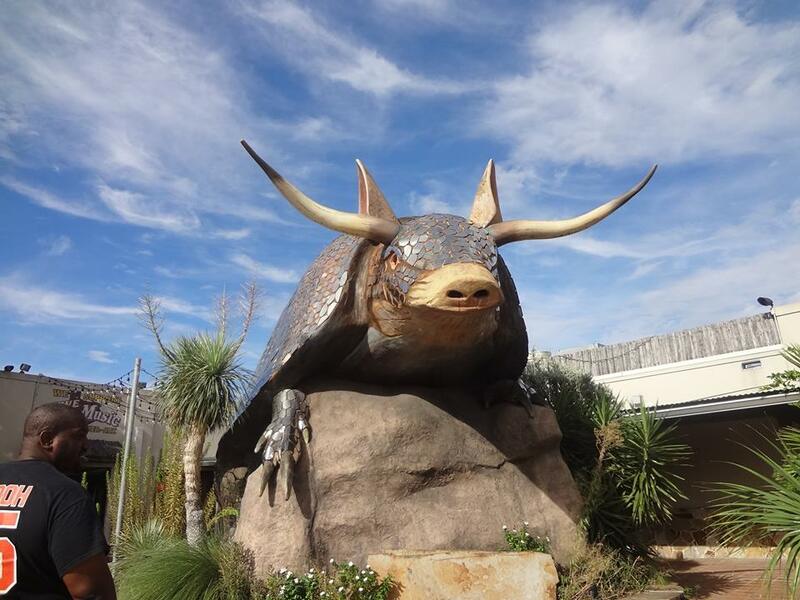 After the monument it was time for a late lunch at Goode’s Armadillo Palace. Akil couldn’t wait to get his teeth into some authentic Texas BBQ, and it didn’t disappoint. We over ordered though, not realizing that the saying is true. You know, about things being big in Texas. Next up was my favorite roadside stop of the whole trip. 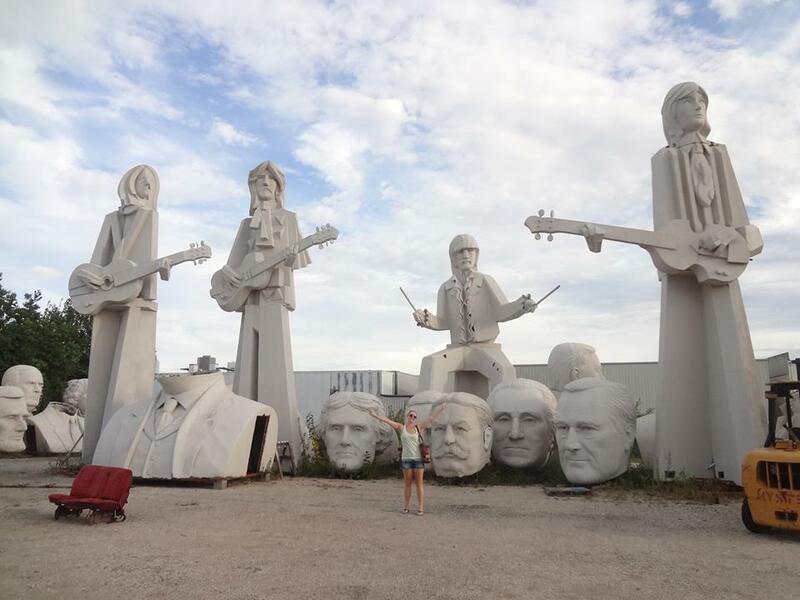 It was giant statues of The Beatles and busts of presidents, all 44 of them. The busts were taller than Akil, and The Beatles statues were several stories high. It was just so cool. 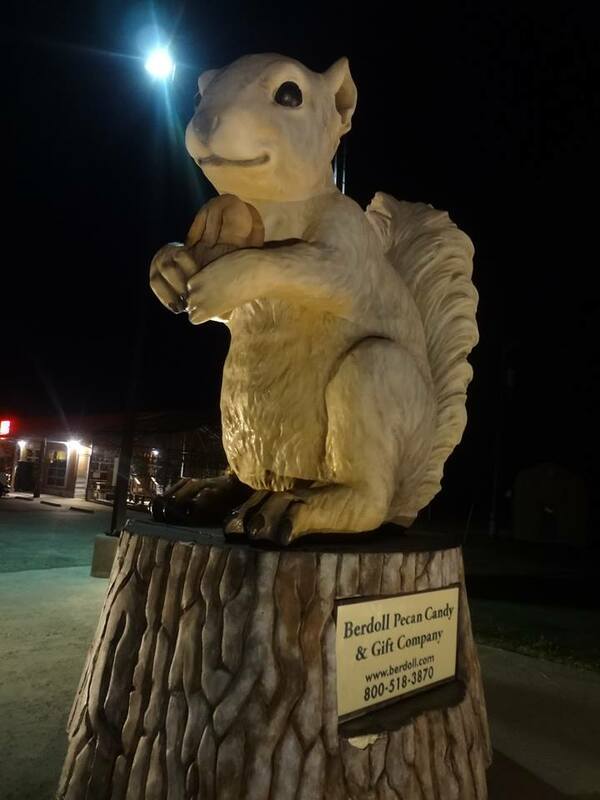 The last pit stop was to pull off the side of the road to see Ms. Pearl, the giant squirrel. It’s exactly how it sounds. My friend Brittany is obsessed with squirrels, so we knew we had to do it. She’s also obsessed with her cat, who is the most photogenic cat I’ve ever seen. FACT! Before I start this post I’d like to ask that we declare it an official “judgement free” zone. I realize that the amount of food and drinks that are about to be described could feed a family of four for probably a week, and we did it in two days with just two of us. I’m not proud of it. Well, maybe I am. Anyway, everyone have their beads ready? Let’s head to New Orleans. I’ve been a little busy lately, and then on a long vacation, so I haven’t had as much time to cook and take pretty pictures lately. 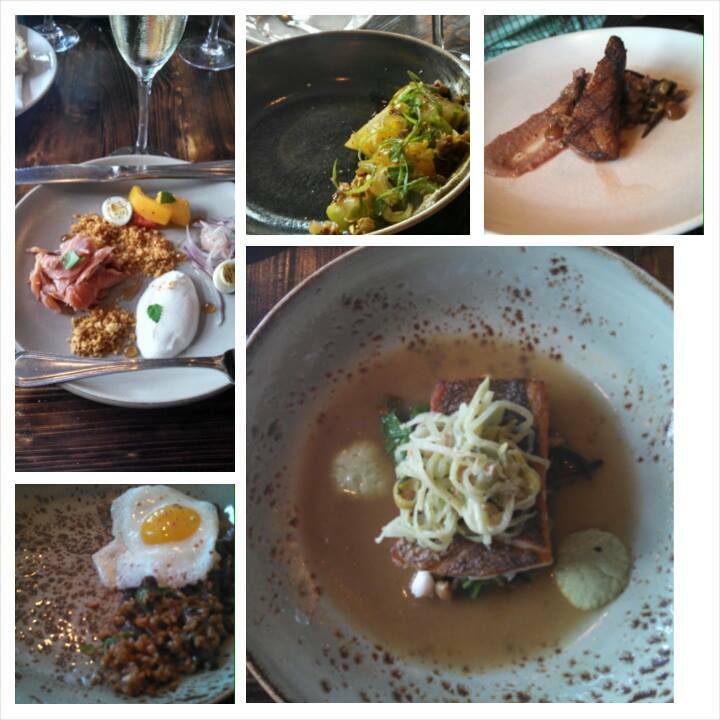 I still want to write, though, so I decided to do what I’ve been meaning to do for a while now, and that is to document the food that my husband and I ate on our honeymoon. For our honeymoon we rented an RV and did a road trip across the southern half of the US. Part of this will also describ our RV experience, but I promise there will be a lot of food talk. I don’t want to say that food was our main focus of the honeymoon, but I also don’t want to not say it…since it pretty much was. Sometimes in life you need to just embrace your inner fat kid and roll with it, and that’s literally what we did.